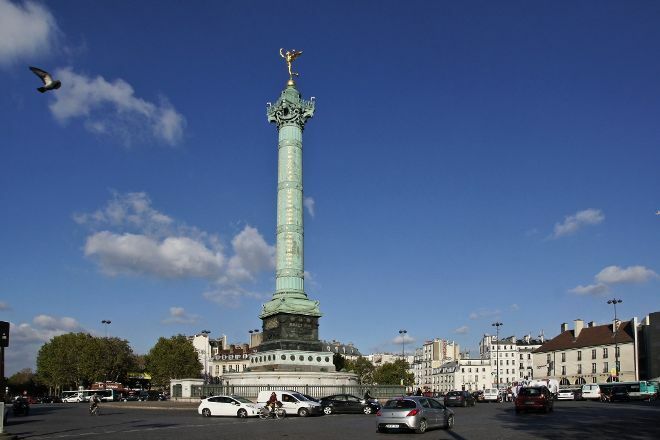 Straddling three arrondissements of Paris, Place de la Bastille marks the site of the former Bastille prison, once a symbol of royal authority in the city. On July 14, 1789, a group of roughly 1,000 Frenchmen fed up with abuses under the monarchy stormed the medieval fortress, spurring the beginning of the French Revolution. This day is commemorated each year in Paris and the rest of France as Bastille Day. Today, the busy square bears no lasting vestige of the building, but it remains a popular site of political demonstration and protest. To see where the prison's foundations once stood, follow a row of paving stones three across between boulevard Henri IV and rue St-Antoine. If you reach the important tourist destination by metro, pay attention to the markings on the platform of Line 5, which also trace the building's former foundations. Use our Paris trip itinerary site to arrange your visit to Place de la Bastille and other attractions in Paris. A statue in a roundabout. Without A historical background it will be a more interesting than Pinocchio at home in Borås.